Android powered sets are getting it’s market share, and the players like Karbon A9 that comes far bellow the average price of the smartphones yet without compromising with the quality, are contributing most to it. It comes with tons of latest features and amazing applications you would least expect in a low-budget mobile phones. This dual-SIM smartphone is integrated with 5MP camera to help you capture live moments of your life. Powered with Google’s Android v2.3 (Gingerbread) OS, this mobile phone gives you the option to select and download loads of applications from Android market. Moreover, Karbon A9 comes with personal computer’s brilliants aspects like built-in data/fax modem also. Competing with other entry level Android devices from other brands like Samsung, LG and HTC, the Karbon A9 comes with a 1 GHz processor and the Android Gingerbread operating system. The smartphone has a 3.8 inch capacitive touch input system based display featuring a resolution of 480 x 800 pixels. And since the voice based assistants is the new talk of the town, Karbonn has included a voice based assistant application in the Karbon A9 as well. The Karbon A9 features dual SIM based design with a 3G and 2.5G connectivity based connections. The Karbon A9 in terms of multimedia comes with in inbuilt Stereo FM radio receiver along with that it has a multi format audio video player integrated as well. There is a 5 megapixel main camera that supports video recording and at the front there is a VGA resolution camera available to facilitate video calling and video chats. A powerful phone with an equally impressive camera. The A9 houses two cameras, a front facing VGA that can be used for video chats and a primary, rear facing camera of 5 megapixel resolution. You can click still pictures or record videos. There is built in flash that helps in getting a better shot in low light conditions. You can also take panoramic shots. The Karbon A9 comes with a massive 1 GB of on board storage along with optional 32 GB additional expandable storage via micro SD memory cards. The supplied battery pack comes with a 1600 mAh rating which should be good enough for a day's worth of heavy or 2 days worth of light/medium usage. There is a 5 mp HD Primary camera with a secondary camera support making the Karbon A9 very handy. The preloaded FM radio ensures that you are entertained on the go. The Karbon A9 is Wi-Fi enabled so you can stay connected from anywhere. All this, with an expandable memory of 32GB makes it a good buy.This handset runs on Android 2.3 with multitasking supported. Apart from the 1 GB internal storage you will need to buy microSD card so that you can start downloading apps from the Google Play. You can move installed apps easily to the micro SD card thereby keeping the internal memory free for a faster and smother performance. MicroSD card up to 32 GB is supported. The android media player supports many formats moreover watching movies on a 480 by 800 pixel resolution is fun. There is the FM radio which you can use for live music. As additional features, The A9 supports voice assisted GPS, voice input, handwriting recognition and live wallpapers. This handset is SNS ready you can use Facebook, Yahoo messenger, Twitter etc and keep connected with your social networks on the move. Just the right choice that were about to make while making into the entry into the world of smartphones, and RightShopping.in is your guise to take the step. 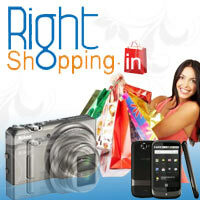 You have the link at www.rightshopping.in/g/p_d.asp?pid=GD100011746&item=Karbonn A9 Mobile Phone to click upon.